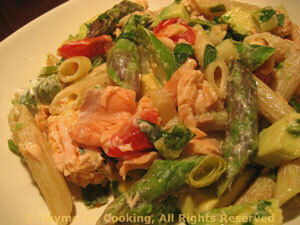 Pasta, Smoked Salmon, Asparagus, Thyme for Cooking easy gourmet dinner. I used cold-smoked, moist, Irish smoked salmon, but use any type you like. It will cook, ever so slightly, while it warms with the pasta. Cook pasta according to package instructions. Drain. Put fresh salmon into a small skillet. Add enough water to come half way up the sides of the fish. Add 1 tbs lemon juice. Cover and simmer, 8 - 10 minutes, just until it turns opaque and flakes easily. Remove, drain and break into large chunks. Snap off ends of asparagus. If white use vegetable peeler and peel bottom half of stalk. Cut asparagus in 1 1/2 inch (4 cm) lengths. Fill large saucepan half full of water and bring to a boil over high heat. When boiling, drop in asparagus and parboil for 2 minutes if green, 3 if white. Drain and immediately rinse with cold water. Sauté leek in cooking olive oil for 3 minutes. Add blanched asparagus, sauté 3 minutes longer. Add smoked salmon, tomatoes, herbs, remaining lemon juice, salad olive oil, and warm slightly, stirring gently. Add drained pasta, avocado, poached salmon, stir gently. Serve warm or at room temperature.